Photographing waterfalls can give you some of the most dramatic images that you will take. Here are ten tips to help you get the most from your efforts from Wayne Rasku writing for Picture Correct. The highest waterfall in the world is Angel Falls in Venezuela, South America. It measures 3.212 ft (979 meters). Getting a good photo of Angel Falls could be a challenge simply because it is so high. You have to get the right lens, probably a wide angle lens, and you must find the right position from which to shoot. This waterfall is nearly a kilometer in height. Not everyone wants to travel to Venezuela to capture the world’s highest falls, but photographing waterfalls is fun and rewarding when you see the results of your efforts in print. 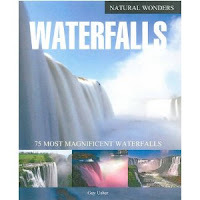 This book presents a hand--picked selection of seventy-five of the most awe-inspiring, tallest, broadest, most powerful, most beguiling and most elegant waterfalls from picturesque locations around the globe. Inside, readers will discover notable examples of every major type of waterfall, from the fine veil falls that are reminiscent of delicate tresses or translucent curtains of fabric, dainty cascades that bubble and tumble over water-sculpted rocks, fast flowing rapids that cut a swathe through the terrain, powerful plunge falls that gush through mid air over high forbidding cliffs, and broad, immensely powerful block formations that discharge millions of litres of water every second over lofty ledges. Concise text places the waterfalls in historical context, revealing fascinating facts about man's discovery of and interaction with these alluring bodies of water. Two pages are devoted to each example, with a lavish, large format colour photograph, plus further pictures that provide an overview of its scale and location. Satellite images pinpoint each waterfall in the world, and its location in the country.